Elektron has always been about giving us powerful, inventive music machines as standalone hardware. They still reign supreme in live dance music sets – certainly in Europe, if you see “live” on the bill at a club, you can expect the appearance of an Elektron device or two as the most likely interpretation. But the price of those machines is learning your way around menus and shortcuts. Some people take to it right away, and some just don’t. And then there’s the monetary price – well into four digit sticker shock, which can be intimidating to new users. To put it less charitably, menu diving can be a buzz kill, especially if you buy hardware in order to avoid that sort of complexity. That changed with the Digitakt and Digitone – compact boxes with more focused feature sets and more of a focus on hands-on control. And the Model:Samples goes further: one-to-one physical controls for most features, and an even lower price. 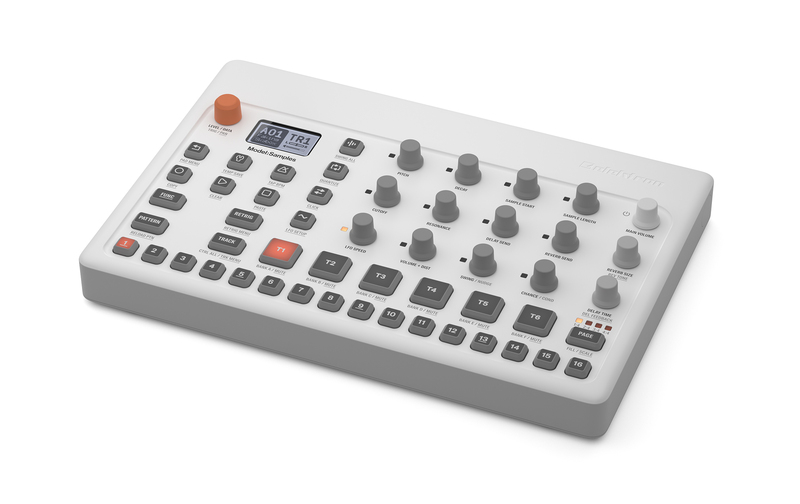 So make no mistake: the Model:Samples is probably aimed first at newcomers to the Elektron brand. (Though I can bet we’ll see Elektron lovers augment their rig with these for extra hands-on control.) Online commenters are comparing this to the used price of other Elektron machines, but that ignores the angle here: simplicity and hands-on control. Model:Samples looks like a powerful groove-based tool with tons of immediacy. 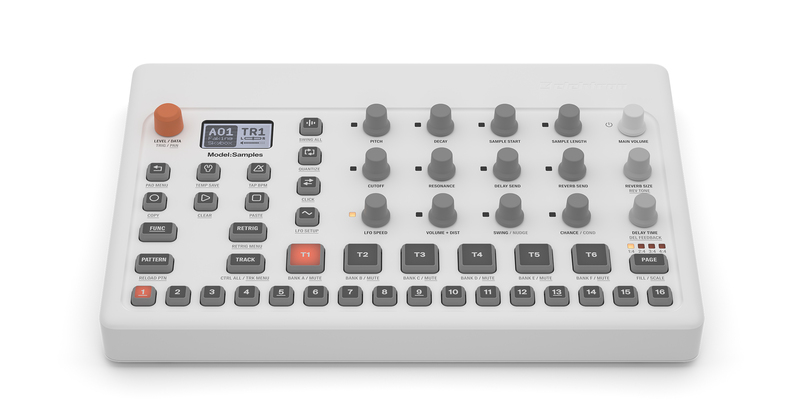 It’s also a real shot across the bow of KORG – entering the price range of the electribe sampler, but with some Swedish sequencing workflows. Spännande! Take that, East Coast / West Coast – Elektron even reference their “ragged Swedish shoreline.” So let’s dive in like we’re taking a brisk swim in the Kattegatt! There are other drum machines and grooveboxes out there, but this looks like a real winner in the price range, at least when it comes to rhythmic flexibility and hands-on parameter control. There’s also a flexible architecture. You get 6 audio tracks – each of which can also be MIDI tracks, making this an effective sequencing box for gear, too. 96 projects, with 96 patterns per project. Each of the six tracks gets its own sample engine, resonant multimode filter, and assignable LFO. Then you can route via sends to delay and reverb. There’s 64MB of sample memory, but you can store up to 1GB of samples, which you load over USB. Everything connects via class-compliant USB audio 2.0, and you get a dedicated headphone out and 2x balanced main outputs. MIDI is delivered via in and out/thru minijacks – now manufacturers are fast adopting that minijack standard for MIDI. They also promise a battery pack at a later date so you can use this on the go. Price here in Europe is 460EUR, $449 USD list. I think that means we could see a US street under $400 – which is a big winner, I think. Heck, this with the Digitone as a synth could be a complete studio. And having just praised the potential of the Akai Force, that could also mean people stick to à la carte gear for playing and go back to the more flexible computer for production. It’ll be fun to shake out these different combinations, though. But that’s beside the point. Cheap, compact, lets you mangle samples with one-to-one knobs and has flexible rhythmic options that let you make polyrhythms and get off the grid – that’s a compelling combo. Add this to the must-watch list for the year. So how does it compare to Digitakt? You of course sacrifice something versus the Digitakt. The big absence – and the one I imagine could be a deal killer for some people – is audio input. That means it might be worth upgrading to the Digitakt or another box if you want to grab sounds directly rather than load them over USB. And speaking of USB, there’s no indication that there’s any plan to bring Overbridge to the Model:Samples. Overbridge is the tech Elektron uses to integrate audio, parameters, and editing between your DAW and their gear. It is probably a bit complicated for the target audience of the Model:Samples, and some of that sort of integration could be accomplished via MIDI and some enterprising users, but I know Overbridge is a selling point for some users. After some delays, that support is in beta for the Digitakt now (and with enhanced support for other Elektron machines). Commenters note some significant sound engine differences – no bit reduction, no compressor, and no filter envelope. The MIDI tracks on the Digitakt are dedicated, too, although if you’re looking for a dedicated MIDI hub this probably isn’t the box you want anyway. More interesting to me is what you can do with per-step samples; commenters are telling us that you can’t lock sounds to steps, but the marketing text for the Model:Samples says you can, so – more on that soon. But other than that, you actually don’t give up much on the Model:Samples versus the Digitakt. Digitakt is 8 voices instead of 6, sure, and it has per-track Overdrive for dirtying things up. But otherwise, most specs are matched by the Model:Samples (storage capacity, per-track LFO and filter, delay and send FX returns). Yes, you give up full-sized jacks. But as long as you can live without audio in, the Model:Samples actually gives you more hands-on sound control in a package that’s significantly more mobile and less expensive. It really does feel like the Model:Samples is a successor to the Digitakt, not a dumbed-down version. I need to confirm with Elektron some of the exact differences as far as sequencing. But given the Digitakt was already a big hit, over the howls of some Elektron loyalists who prefer the more expensive boxes, I stand by my prediction – I think this one is going to reach an even broader audience. And isn’t hands-on control and accessibility the reason a lot of people buy hardware in the first place?